Though dental implants are one of the more recent dental innovations, they’re a proven solution to the problems caused by missing teeth. It’s important to note that we say “problems” because dental issues caused by missing teeth extend beyond the self-consciousness they often cause. From jaw bone loss to shifting teeth—which lead to misaligned bites, jaw pain, and teeth grinding—missing teeth can do a lot of damage in the long term. Dr. Brito has spent a great deal of time receiving training on how to properly place and restore implants. Our team is equipped with the expertise to confidently offer implants as an alternative solution to missing teeth. Prior to dental implants, solutions for missing teeth ranged from doing nothing to getting bridges, partials, and dentures to fill the gap. While each of these options has merit, dental implants offer a permanent solution to not only the missing tooth, but the bone loss that is inherent with this condition. Dental implants can replace a single tooth, several contiguous teeth, and even a full arch (upper or lower jaw). The process is largely the same regardless of where and for how many teeth the implant is being placed. A titanium post is placed directly into the jaw bone. Implants take up to several months to fully fuse to the bone. Once this healing is complete, the missing tooth is replaced with a crown. The crown attaches firmly to the implant post, and patients can enjoy full tooth function. A dental implant is an artificial root made of titanium that is placed in the mouth in the space where the patient lost their tooth. Patient is given local anesthesia and Novocaine before the procedure starts. The procedure doesn’t feel any different than getting a filling done. After the implant is placed, a healing period of 3-4 months occurs. During that time, there will be a temporary tooth placed to mimic what the tooth will look like when fully restored. After the 3-4 months of health, we check to see if the implant is stable. Then we taken an impression. About two weeks after that, we place the final restoration, including the crown. As we mentioned above, dental implants can be used in several scenarios. To read more about these types and the benefits of each, click here. If you have questions about implants, or if you think you may be a candidate for them, we welcome you to contact our office to schedule a complimentary consultation. Dental implants look, function and feel like natural teeth. 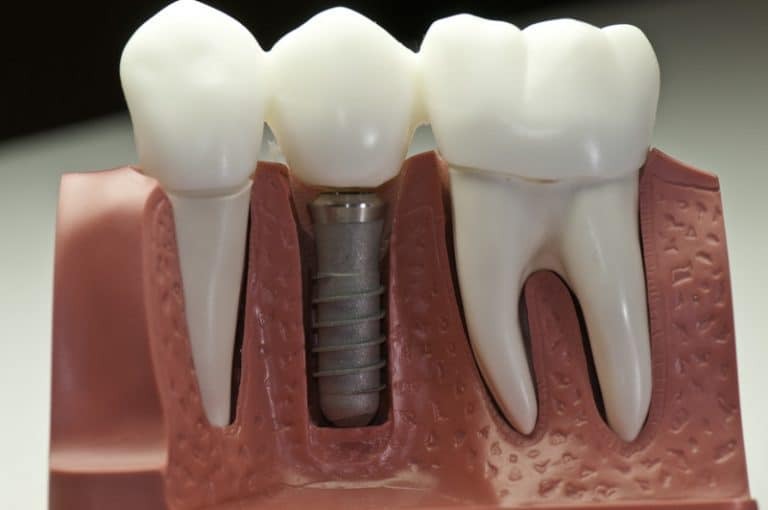 Implants can be used to anchor and stabilize dentures. Dental implants will never get decay and never need root canals. Implants also stimulate your jawbone and preserve bone levels, so your face doesn’t shrink in after tooth loss. Missing teeth have a profound effect on chewing and stability of the remaining teeth. Often, teeth will shift in the absence of their neighbors which may lead to decay, periodontal disease and additional tooth loss. A dental implant is a great solution to replace these missing teeth and restore biting function and stability. With great home care and regular check ups, an implant can last a very long time. Do you need a tooth (or multiple teeth) replaced and want the top implant specialist in Boston to perform the procedure? Call Brito Family Dental at (617) 766-8496 to schedule your consultation.